Various factors dictate what operational structure a business chooses. Typically, its size or the diversity of its geographical locations or products determines the most effective structure to use. A business in a single location producing a single product will have a much different structure than one divided into several locations and producing diversified products. A centralized structure is common to small and medium organizations but is effective only in large businesses where the product line is limited and operations are in close proximity. The centralized approach focuses decision-making authority solely at the top, typically with its chief executive officer (CEO), president, general manager or owner. Operational decisions are made at the top of the organization with little or no authority delegated to its lower levels. A decentralized organizational structure is perhaps the most effective structure for an organization that has a diversified product mix or has dispersed its operations to several remote locations. Authority is delegated to several decision makers, who are typically the heads of product-oriented divisions, operating sites or sales regions. Decentralized organizations often employ a management team approach for both strategic and tactical business decisions. Centralized organizations are typically more efficient as far as assuring that a business decision made at the top is passed down through the organization. The CEO or other high-level company official passes a decision or policy to the next level down and this information is passed on down level by level. 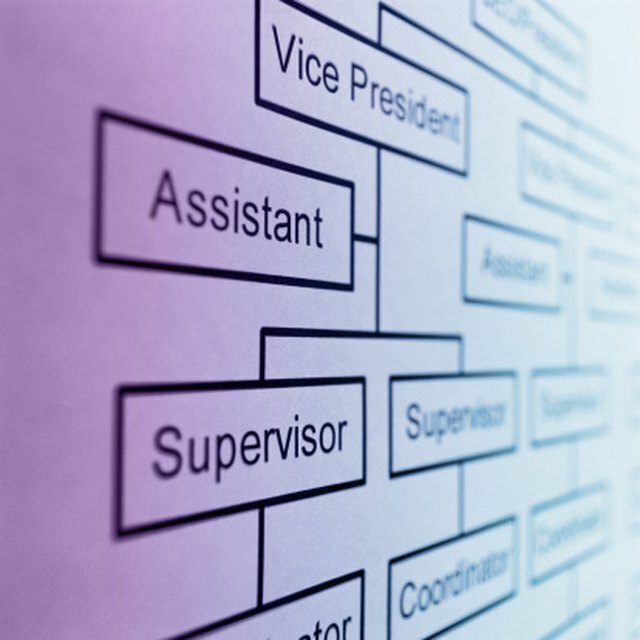 Another characteristic that can be an advantage of a centralized organization is that the reporting structures are clearly defined along the lines depicted on the organizational chart. Decentralized organizations have the advantage of placing product- or service-specific managers at the tops of its various entities. These managers focus specifically on a particular set of operations or products in a sub-organization that could be centralized. Corporate top managers, freed of operational duties, are able to focus on the company's strategic planning and finances. While it can be a good approach for a smaller business, the centralized organizational approach can become too rigid or inefficient for a growing business, especially if the growth involves any type of diversity. Centralized organizations may disregard employee suggestions and ideas. An organization that applies a decentralized approach may find that certain functions within the central corporate offices may become bureaucratic in an effort to centralize common activities to save money. A decentralized organization may also grow beyond the ability of the corporate officers to strategically plan effectively for the whole concern. Neither approach, centralized nor decentralized, is the best, or even better, approach in all situations. Which is better is a function of the management style of the top manager, the company's products or services and perhaps even its location.